A fan vault is a form of vault used in the Perpendicular Gothic style. All its ribs are of the same curve and spaced the same. This beautiful and elegant Gothic style of architecture, at its earliest appears in 1351. 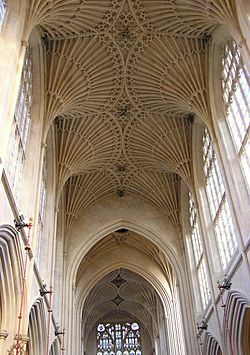 King's College Chapel, Cambridge, the world's largest fan vault, built from 1512 to 1515 by John Wastell, with William Vertue. Fan vault Facts for Kids. Kiddle Encyclopedia.